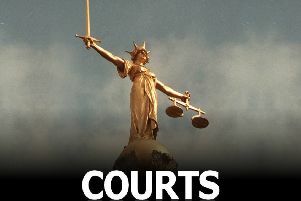 A man accused of a series of Melton robberies and other offences will stand trial at Leicester Crown Court next month. Neil Gordon (41), of New Street, Melton, appeared before Leicester Magistrates Court yesterday (Monday) charged with 11 offences, including robberies at the Craven Street Stores and One Stop Shop on Wednesday. His case was committed to crown court on Monday April 3 and he was remanded in custody. Gordon is charged with robbery and possession of an offensive weapon in connection with a robbery at a post office on Craven Street, Melton, on Wednesday March 1. A 42-year-old woman has also been arrested on suspicion of conspiracy to commit robbery and released on police bail. Gordon has been charged with attempted robbery and possession of an offensive weapon in connection with a robbery at a convenience store on Grange Drive, Melton, on Wednesday March 1. A 42-year old-woman has also been arrested on suspicion of conspiracy to commit robbery and released on police bail. Gordon has also been charged with theft and actual bodily harm in connection with a robbery at a newsagent on Sherrard Street, Melton, on Saturday. He also faces charges of robbery and possession of an offensive weapon in connection with a robbery at a convenience store in Thorpe Road, Melton, on Friday December 30. Gordon has also been charged with attempted robbery after a man was assaulted on Sandy Lane, Melton, on Friday March 3. He has further been charged with actual bodily harm and common assault following an assault on two people on Sage Cross Street, Melton, on Friday March 3. A 42-year-old woman has also been arrested on suspicion of assault and released on police bail.